The Vixens battle the Southside Serpents in this early preview of BETTY & VERONICA VIXENS #4! This is it — the battle you’ve all been waiting for! It’s the Southside Serpents vs. The Vixens in a face-off where all of Riverdale is at stake; but when the Serpents up the ante, things might get deadly! What’s new in the world of Riverdale and beyond? Take a look below at previews of JUGHEAD: THE HUNGER #3, BETTY & VERONICA VIXENS #3, ARCHIE’S BIG BOOK VOL 2: FANTASY, and ARCHIE GIANT COMICS ROLL. The Vixens go to war in this early preview of BETTY & VERONICA VIXENS #3! The Vixens are taking matters into their own hands and doing whatever they can to protect their hometown. But are they a match for the dangerous Southside Serpents? Betty and Veronica take back Riverdale in the new BETTY & VERONICA: VIXENS series! Preview the new Archie Comics releases for 11/22/17! What’s new in the world of Riverdale and beyond? Take a look below at previews of BETTY & VERONICA: VIXENS #1, RIVERDALE #8, YOUR PAL ARCHIE #4, ARCHIE AND ME COMICS DIGEST #2, THE BEST OF ARCHIE AMERICANA: GOLDEN AGE (TR), and BETTY & VERONICA COMICS DOUBLE DIGEST #258. 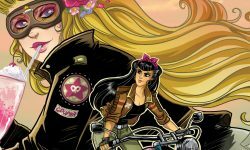 Chopper chicks ready to roll – It’s Betty & Veronica like you’ve never seen them before! Preview BETTY & VERONICA: VIXENS #1! When trouble finds its way to the quiet town of Riverdale, a new group of masked motorcyclists emerges to keep their town safe and protect each other by any means necessary.